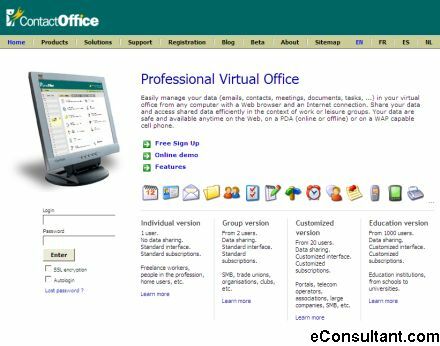 Description : Easily manage your data (emails, contacts, meetings, documents, tasks, …) in your virtual office from any computer with a Web browser and an Internet connection. Share your data and access shared data efficiently in the context of work or leisure groups. Your data are safe and available anytime on the Web, on a PDA (online or offline) or on a WAP capable cell phone.